A dust storm is a meteorological phenomenon common to arid and semi-arid regions, when strong winds erode and blow loose sand from their dry surface, and in the process move soil from one place to another. Drylands of North Africa and Arabian Peninsula are the main terrestrial sources of airborne dust. Also with some contributions from Iran, Pakistan and India into the Arabian Sea, and China’s significant storms deposit dust in the Pacific (wiki). In India, dry season runs through April to June, with sporadic storms originating from Afghanistan, Pakistan, and Western India. 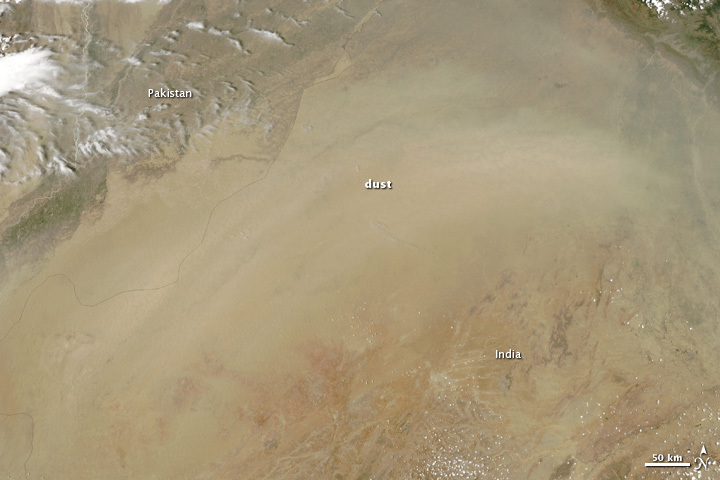 The image (below) of an intense dust storm on June 2nd, 2010, analyzed with MODIS and OMI data (source:NASA), illustrates the geographical spread of these storms. Multiple modules are available as part of the WRF-chem model, to simulate and include the dust storm emissions during the regional and the urban chemical transport simulations. More details on GOCART module and WRF-chem tutorials.